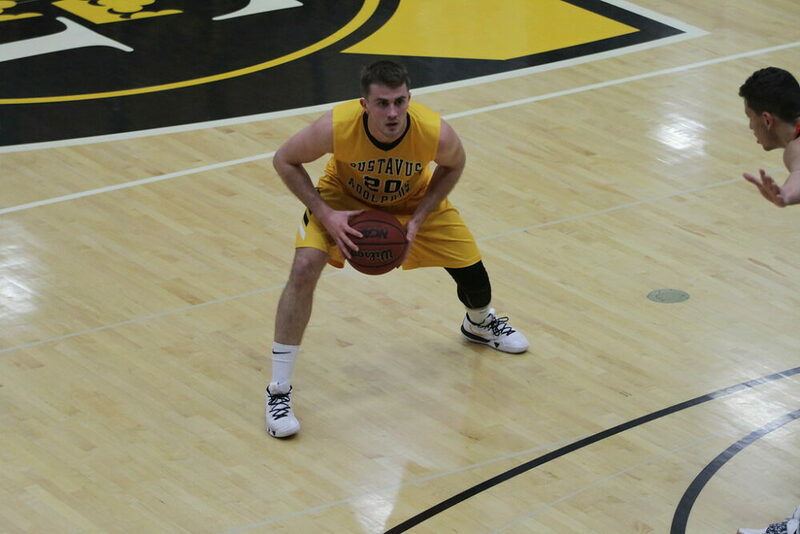 ARDEN HILLS, Minn. – The Gustavus men’s basketball team traveled to Bethel on Monday night and the Royals scored 50 points in the paint to propel them to an 83-64 victory. With the loss the Gusties fall to 7-10 overall and 4-8 in MIAC play. After a Riley Sharbono (Sr., Marshall, Minn.) three pointer tied the game at 7-7 less than three minutes in, the Royals went on a 12-2 run to jump out to a 10 point lead and they would maintain that lead for the duration of the contest. Gustavus was able to trim the lead to six at the 8:41 mark thanks to a Brandon Snoberger (Sr., Rice, Minn.) three-pointer and then with 5:16 remaining in the half a Vannis Smith (Jr., Crystal Lake, Ill.) fast break layup would cut the lead to four. Bethel held the Gusties scoreless the final five minutes though and they tacked on six more points for a 10 point halftime cushion. In the first half of play the Gusties had 10 different players score with Sharbono and Spencer Tollefson (Sr., New Richland, Minn.) leading the team with five points each. In the first 20 minutes the Gusties shot 41.4 percent (12-29) while the Royals shot 51.5 percent (17-33). Bethel jumped out to another hot start in half number two going on a 9-3 run to accumulate a 16 point lead at the 15:37 mark. A Nolan Malo (Fy., Owatonna, Minn.) three-pointer with 12:39 remaining capped off a 15-9 run for the Gusties and cut the lead to 10. Bethel though rallied again and pushed their lead to 23 at the 7:58 mark and Gustavus wasn’t able to overcome the deficit. In half number two the Royals shot well again going 18-of-32 (56.3 percent) compared to the Gusties 13-for-28 (46.4 percent). The Gusties were led in scoring on the night by Sharbono who notched 16 points and Logan Rezac (So., Andover, Minn.) who had 10. Gustavus will be back at home on Wednesday when they host St. Olaf at 7 p.m.